The Best Time for Birding is NOW! Are you ready for Spring Migration? THE very best time of the year! The reports are in and It is ON!!! Here are The Backyard Naturalist’s best tips and resources to help you get the most out of Spring Migration. Migrants are arriving daily! The Backyard Naturalist has been eagerly checking progress via this Cornell Lab of Ornithology’s BirdCast and our own backyard. When, where, and how far will birds migrate? Cornell Lab of Ornithology‘s migration forecasts answer these questions for the first time. 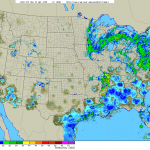 The Cornell Lab interactive map tracks Spring Migration in real time! There are frequently updated regional statistics for each species as sightings increase and decrease. This is a new, unprecedented level of migration data gathering and analysis that will help research and aid in wild bird conservation. And a wonderful resource for birders year round, too! If anticipation isn’t already high enough for Spring Migration arrivals, Cornell Lab BirdCast also forecasts wild bird movements for the week ahead! Now that you know who’s here and who’s on the way, here’s how you get started. The statistics and reports indicate your favorite out-of-town guests have arrived, but you may be wondering why you’re not seeing them at your backyard feeders. Please don’t feel snubbed or disheartened if your regular feeder contents aren’t attracting crowds of Orioles, Warblers or Vireos as they arrive. It’s not you. There are reasons for this and there are other things you can do to improve your chances to see these birds. Female Baltimore Oriole visiting Tom Wildoner‘s backyard bird bath. And just one more time. Water. We just can’t say it enough. Accessible water is always critical in any season! 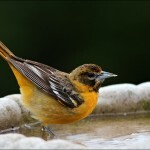 For a migrating bird, your backyard bird bath is the best invitation you can give. Hey, you’d want a cool drink and a bath, too, if you’d just flown 3,000 miles! It’s time to clean out your bird baths, fountains or trays and keep them filled with fresh water. Keep an eye on the water level, as you may get some exuberant splashers! Check every day to make sure the water remains fresh, too. Make sure your binoculars and your camera are handy, right by the window. You may need to move quickly to get a good view. Can you identify your visitor? Knowing is part of the fun. A good birding guide is indispensable and will really enhance your birding experience, so keep it handy, too! &ast;This is our personal favorite, but another one might be the right one for you. When asked for a recommendation, we always say, “Find one that sings to you!”. The right field guide will be your best friend. Once you’ve made an ID, finding out the distance this amazing bird has just flown to get to your backyard is astonishing and humbling to consider. Investigating further, and we promise you will be glad you did, you are bound to find other amazing things to ponder, even some unexpected wonders about wild birds you see every day! Keep in mind, you may not be able to get a visual on a wild bird you suspect is nearby. For example, even though you are looking your hardest, you will likely hear a Baltimore Oriole before you see a Baltimore Oriole. Like many others, they tend to forage up higher and in denser foliage. We don’t recommend climbing trees to find out who’s visiting your backyard. There’s a better way to find out who’s there and what they’re up to — without disrupting their business or breaking your arm. Bird sounds this time of year are beyond insane! As migratory birds head north, their vocalizations get more frequent and intensify as they get closer to their destinations. Birds who’ve been here the entire time are now singing with all their might to attract mates and define territories. 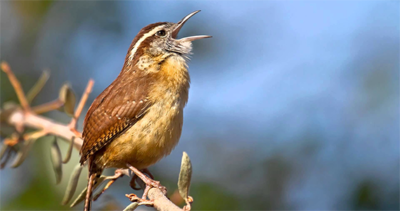 The Cornell Lab of Ornithology website hosts an awesome reference that will help you differentiate the varying calls of each species, with detailed information about wild bird songs—and the Cornell Lab of Ornithology Macaulay Library is the world’s largest archive of wildlife sounds. This is THE original that everyone emulated. Peterson ups the game with more. Birds of Maryland and Delaware Field Guide (Includes Washington, DC and The Chesapeake) – This guide is most specific to our area. As fewer species are included, this may be the best choice for junior birders. iBird PRO and Chirp! USA – The Backyard Naturalist uses these two and highly recommends either of them. Be where the action’s happening! Join an organized field trip, bird walk or bird count. Montgomery County Parks – Four nature centers offer a variety of programs and events year round. See the Spring 2015 calendar for more. Share your sightings and photos with other Maryland birders on MD Birders Facebook page. Birding novices and experts alike post questions, advice, sightings, photos and more on this dynamic and very active Facebook page. And we love hearing from you on The Backyard Naturalist Facebook page, too! We promise we’ll never stop liking your wild bird stories and photos! And, we’re always here if you have any questions. Just stop by the store or give us a call!